The Tank is one of the most famous elegant wristwatches for men and women worldwide. Introduced in 1917, its design was inspired by tanks used in the First World War. Fans of vintage timepieces will discover a large pre-owned market. At first glance, the Tank doesn't look like a military watch. It coordinates better with a nicely tailored suit than it does with an army uniform. It's also meant for civilian use, unlike many diving and pilot's watches developed for marines or fighter pilots. However, its distinctive shape was inspired by the armored tanks used in the First World War, especially the Renault FT-17. Other sources claim the Tank was inspired by the British Mark IV. Both tanks had distinctive tracks, especially when viewed from above. 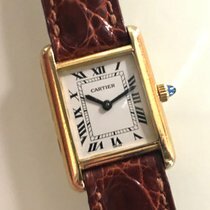 Cartier used the look when designing the Tank's four straight and relatively large lugs. A special feature of the Tank is the blue sapphire on its crown. The original Tank had chamfered Roman numerals, which are still present on most models today. A railroad minute track and two blue hands—there was no seconds hand—are additional characteristics from the first models that are still used to this day. The Tank has undergone a number of changes over its lifetime. Since its introduction, there have been around 250 different versions released. 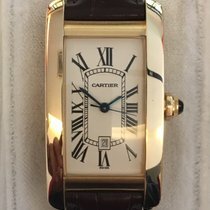 Cartier has continually altered the case materials, dial designs, calibers, and bands while maintaining the same basic features. This watch is available in stainless steel or gold and with a quartz or in-house caliber. Its unique rectangular shape and harmonious linear design have helped the Tank to become a major success from the start. 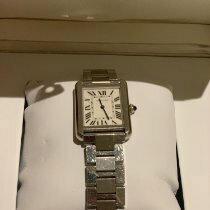 How much does a Cartier Tank cost? 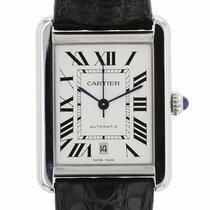 The Cartier Tank is an iconic luxury watch with a groundbreaking design. When paired with certain attire in the right atmosphere, this timepiece gives off an air of elegance, style, and good taste without showing off. Thanks to the many different versions from various decades, Tank watches are available at a range of price points. If you're willing to spend over 2,900 USD, you can purchase a new stainless steel Tank with a mechanical movement. The most expensive models are in a completely different price range. It's not rare to find a yellow, white, or pink gold diamond-set Tank for over 58,000 USD. Entry-level models are powered by quartz movements and available in good or very good condition for around 1,200 USD. Many quartz watches can be found for less than 2,900 USD, though prices over 4,600 USD are not unheard of. 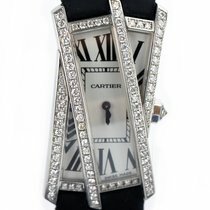 Cartier has divided the Tank into several different collections. The design of the Tank Louis Cartier remains very close to that of the original Tank from 1917. This watch was named after and worn by the creator of the famous watch. The manufacturer offers this timepiece in yellow, white, and pink gold paired with a leather strap. For around 10,400 USD, you can purchase a 33.7 x 25.5 mm case made of 18-karat yellow gold with a quartz movement. The gold version with a manual, in-house movement is significantly more expensive, costing around 34,800 USD. The Tank collection also has its own introductory model, the Tank Solo. You can buy new stainless steel models with a quartz movement for about 2,300 USD. When powered by an automatic movement, the Solo costs around 3,000 USD. A new, quartz-powered pink gold model can cost over 4,600 USD. The pink gold version with an automatic movement is the most expensive Tank Solo, costing around 8,100 USD. The Jaeger-LeCoultre Reverso is an alternative to the Tank. This competitor used to supply calibers to Cartier, so some Tank and Jaeger-LeCoultre watches are powered by the same movement. The most noticeable feature of the Tank Anglaise is its crown, which is integrated into the case. A small bridge protects the upper side from direct contact. The Anglaise is available in a variety of models. These range from stainless steel models costing 4,600 USD to bicolor models costing around 7,000 USD. There are also gold versions set with diamonds available for prices around 46,400 USD. Released in 1996, the Tank Française sits beautifully on the wrist thanks to its slightly arched case. The stainless steel quartz version costs around 1,700 USD, while the bicolor yellow gold/stainless steel version sells for 2,900 USD. The Tank Américaine is longer than its other Tank siblings. Its domed case comes in your choice of stainless steel or pink, yellow, or white gold. Prices for an Américaine begin around 4,100 USD for quartz-powered models. Automatic gold timepieces studded with precious gemstones can cost up to 46,400 USD. 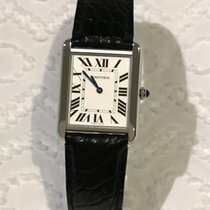 The Cartier Tank MC is more square-shaped than the other Tank models. Furthermore, it has a larger case and is thus primarily marketed as a men's watch. Stainless steel timepieces with small seconds mark the entry point into this collection and cost around 5,800 USD. Chronograph models cost upward of 8,100 USD. If you want a pink gold chronograph, be prepared to spend around 20,900 USD. A special skeletonized MC with a palladium case demands around 58,000 USD. You can view the watch's manual movement at work through its sapphire glass case back. The name of this watch gives away its design inspiration. General John Pershing (1860-1948) received one of the first Tank watches as a gift in 1918 when he was commanding US troops in Europe. Louis Cartier, a descendant of the company's founder, personally gifted Pershing a watch in advance of its release. 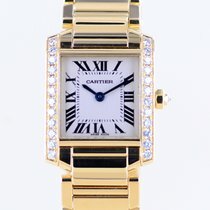 Cartier developed the watch in 1917 after he saw the first tanks on the front. In the 1920s, this spectacular new wristwatch significantly contributed to the gradual drop in popularity of pocket watches. Louis-François Cartier founded the company in 1847 in Paris. He began making jewelry and was soon delivering his work to members of nobility such as the French Empress Eugénie. 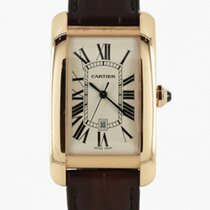 In the 1870s, Cartier's son expanded the company's offerings. The Santos, first introduced in 1904, is considered the first pilot's watch and first wristwatch with a leather strap.